We were thrilled to be featured in the October/November issue of Working Mother magazine as an easy and affordable solution to get the job of dinner done. 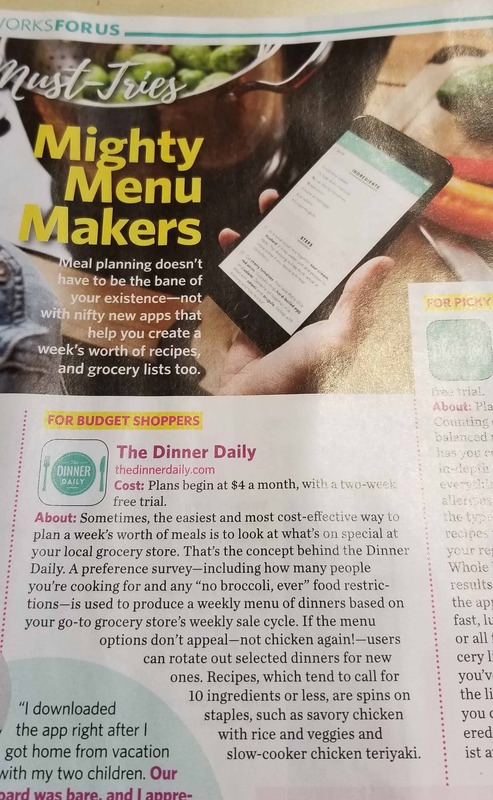 The article, “The Mighty Menu Makers” recognized The Dinner Daily for our focus on helping busy families solve dinner all while helping them lower their grocery bills. It is a great honor to be included in the magazine due to their focus on busy working women and their challenges of balancing work with family and home life, something our team lives every single day! As referenced in the article, The Dinner Daily has become known as the meal planning service that not only helps families with dinner, but also as a resource for staying on budget with their food costs. Our unique system of incorporating what is on special each week at major grocery retailers across the country has helped thousands of busy families across the country prepare easy and simple home cooked dinners and realize significant savings at their local grocery store. You can read the full article in the image above.